Comprehensive policy reform can help combat the Type 2 Diabetes epidemic through efforts directed at disease prevention and management. As part of the Bristol Myers Squibb Foundation’s Together on Diabetes Initiative, the PATHS (Providing Access to Healthy Solutions) project has researchers and attorneys identifying opportunities for impactful policy change with respect to type 2 diabetes in New Jersey and North Carolina. National implications for this state-level work. During the Web Forum, we will also discuss the translation of on-the-ground disease management experience into policy and legislative action, and will introduce the soon-to-be-live CHLPI website intended to be a home for diabetes policy reform resources. This Web Forum is for all diabetes providers who know that systemic change is necessary for good health outcomes in their patients and clients, as well as local and state-level policymakers, legislators, and advocates. 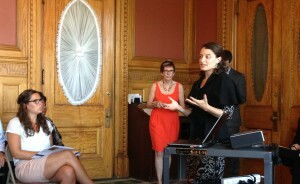 Sarah Downer, Clinical Instructor on Law, speaks about diabetes policy to Massachusetts senators, representatives, and legislative aids. The Center for Health Law and Policy Innovation’s work on PATHS – a project targeting diabetes-specific health advocacy – has caught the attention of Massachusetts’s legislators. Bringing a broad policy focus to the Together on Diabetes initiative funded by Bristol-Myers Squibb Foundation, PATHS collaborates with health care providers, legislators, and other stakeholders to provide policy guidance and technical support for legislative implementation. Its most recent publication is an exhaustive 150-page state report that provides evidence-based policy recommendations for North Carolina. Last Wednesday, clinical instructor and one of the authors of the report, Sarah Downer, presented at the Diabetes State Briefing held at the State House. The three-hour event was one of several educational conferences hosted by Women in Government (WIG), a national, non-profit organization of women state legislators that provides networking and leadership opportunities for members to address public policy concerns. WIG handles a spectrum of policy issues including (but not limited to) economic development, education, energy and environment, and health. Issues of particular concern in Massachusetts include: increasing obesity rates (the largest risk factor for developing type 2 diabetes) within lower-income populations, the diminishing funds for diabetes research and lack of financial incentives for credentialed healthcare providers to serve the populations most hard hit, and the imperative to increase access to certified Diabetes Prevention Programs (DPP), which are targeted at lifestyle changes. Ms. Downer underscored the issue of rising diabetes rates within underserved populations, citing 2012 statistics that show Massachusetts for having the 4th highest childhood obesity rates for children ages 2-4. To address prevention in Massachusetts, presenters emphasized that programs focusing on lifestyle change, like the Diabetes Prevention Program, are crucial to positive health outcomes and decreased future health care costs. “DPP is specifically for people diagnosed with pre-diabetes,” according to Ms. Downer. “State Medicaid programs should cover participation in this program because it is targeted, a proven and discrete intervention, and cost-effective.” A statistically rigorous study conducted by the Diabetes Prevention Program (DPP) Research Group concluded that the federal government could save $1.3 billion in a 10-year window if Medicare covered the program for prediabetics. Just within 3 years, DPP can reduce the incidence of diabetes within a population by 58%. A cost-benefit analysis further reveals an even greater impetus to implement it: the expense of administering DPP per capita is approximately $450. As the average annual cost of healthcare for someone with diabetes is about $9,000 greater than for someone without a diabetes diagnosis, health care payors will realize a significant financial benefit from investing in this prevention strategy. For CHLPI and two other attending organizations – Joslin Diabetes Center and the American Diabetes Association – the State Briefing provided a unique opportunity to communicate their concerns to state legislators who have been key supporters of health-related bills, including bills to help patients access diabetes care. One of the attendees, Representative Gloria Fox (D, Seventh Suffolk), had submitted the bill H.1956 “ to establish a statewide program to promote prevention, diagnosis and treatment of Type 2 diabetes,” which is currently pending in Committee. The other legislators at the conference, Senator Harriette Chandler (D, District of First Worcester), Senator Jennifer Flanagan (D, District of Worcester and Middlesex), and Representative Kimberly Ferguson (R, District of First Worcester) have proposed and helped pass bills related to healthcare financing and improving public health standards. “Prevention is key,” concluded Senator Chandler as the conference adjourned. Organizing communities into “prevention for health” caucuses, planning infrastructure improvements such as walking paths, and implementing other “feet on the street” programs were but a few of the action items that the senator put forth as recommendations as Massachusetts strides towards diabetes prevention program in its next steps for disease mitigation.